Since Thursday afternoon, the US Coast Guard has been searching an area near the Bahamas for a passenger who went overboard early Thursday from Royal Caribbean's Monarch of the Seas when it was nearing Coco Cay a/k/a Little Stirrup Cay. The 23-year-old woman was reported missing by her husband, who works aboard the ship, Thursday at 12:15pm. She was last seen about 3:45am. The ship and Coco Cay were searched and numerous announcements were made, but the woman was not located. The US Coast Guard and Bahamian authorities were notified at approximately 2pm. Upon reviewing the security video, it was found that the woman went overboard from Deck 12 of the 74,000-ton cruise ship at 4:11am. The video shows the woman was wearing a black tank top and white skirt at the time. Deck 12 is the ship's highest deck where the jogging track is located. There are no passenger staterooms on the deck. Government officials have reviewed the footage and determined that the guest jumped overboard. Engaged in the initial search were a Coast Guard HU-25 Falcon jet, a Coast Guard HH-60 Jayhawk helicopter and a Coast Guard cutter. Royal Caribbean’s Guest Care Team is providing support to the woman's husband. Monarch of the Seas was operating a special 5-night itinerary this week which departed Port Canaveral on Monday (December 28) calling at Nassau and Coco Cay. It is return to Port Canaveral on January 2 as scheduled. The Coast Guard suspended their search at 4:30pm on Saturday (January 2) without finding the woman or her body. According to published reports in India (where the couple is from), the woman's family allege she was the victim of ongoing domestic violence, and they believe that is what drove her to end her life. It's the holidays, and in the days leading up to them, Ellen DeGeneres always gives audience members some pretty good merchandise as gifts, but the members of today's audience had no idea just how good one of their gifts was going to be. After she gave them a video camera and other smaller items together worth several hundred dollars, most were flabbergasted when every member of the audience of more than 300 received a 7-day cruise for two aboard Norwegian Cruise Line. The video is below. The complete story about why cruise lines participate in such expensive giveaways appeared in the December 17 edition of Cruise News Daily. The first of the capacity reductions in Alaska are set to begin this summer, with further reductions in 2010. Last week, as we reported, Carnival brands Holland America and Princess announced even further reductions for 2011. From the coverage in Alaska, it seems that some people are beginning to understand that tough times are ahead for state's economy, especially that portion of the population which is directly dependent on the tourism industry. Everyone else, however, seems caught up in debating one issue or another. Is the $50 tax on cruise passengers hurting the market? Is the tax really legal? Do the cruise lines really pollute? Guess what. None of these issues themselves are important to the situation. None of them. What is important is a very basic business principle that no one in the state seems to remember. Here it is: Alaska has a product to sell: Alaska. The cruise lines are the customers. If the cruise lines don't want to buy the product - for whatever reason - they can simply take their business elsewhere and buy someone else's product. In this case, the cruise lines feel the price they are being charged by the merchant is too high, so they are buying less of the product from Alaska and more of it elsewhere. That high cost is a result of several things directly in the control of Alaskans. They don't want to debate it with the state. They've been expressing their opinion to "the management" for several years, and their "complaints" have not been responded to. Think of it like a restaurant. If you keep increasing and increasing your prices, well past your competitors' prices, eventually customers are going to begin to come less frequently. If they take the trouble to tell you why they aren't coming as often anymore, you don't argue with them about it. To stay in business, the restaurateur has to take a hard look at his operation, figure out exactly what the customers don't like, and then change what is necessary to entice them back. That's what Alaska needs to be doing. Alaska also needs to realize that what they do at this point probably isn't going to bring ships back to the market. Success will need to be seen in terms of just keeping more ships from leaving. In the last decade, while Alaska has been developing new ways to extract money from the cruise industry, they seem to have been totally unaware that the cruise industry was changing. It's no longer a seller's market for them. Alaska is now in a very competitive market with other ports around the world for cruise ship calls. The American companies Alaskans are dealing with are no longer selling primarily to Americans. With the expansion of the industry, Americans will soon be the minority of those buying cruises, and cruise lines want to position their ships where those new customers (and generally higher-paying customers) live. Europe is experiencing rapid growth. South America and Australia are exploding, and while the Asian market is in its infancy, that market is vast. As it is, cruise lines don't have enough capacity to move into all the markets they would like to. A couple at a time, the entire Alaskan fleet can easily be absorbed elsewhere. Alaskans need to stop debating the issues, and do like the restaurateur. They need to figure out what's wrong with their product, and make changes to please their customers - if they want to keep them. A suspicious package was found in Melbourne's (Australia) cruise terminal today (1:30pm Saturday afternoon). Sniffer dogs alerted on a package in area with luggage for Sun Princess. The ship was evacuated as well as the terminal and Diamond Princess which was also at the terminal according to local media reports. By 6:30pm, the package was cleared and found to contain military uniforms, and boarding resumed. Holland America has added a neat photo on their blog today. It's a panorama photo taken from the top of the funnel of Nieuw Amsterdam which is currently under construction at the Fincantieri yard in Marghera (Italy). The panorama is a 360-degree view of the shipyard. Not only can you see the regular activity in the yard, but and you can also see Costa Deliziosa being built at a nearby berth at the yard. Nieuw Amsterdam will be delivered to Holland America in June. Carnival Corp announced today that Royal Princess will be transferred from their Princess brand to the P&O brand in the spring of 2011. P&O will rename the ship Adonia. The change will cancel five previously scheduled Princess sailings in April and May 2011. The change will also have the affect of further reducing berths in Alaska in the summer 2011 season. Royal Princess is operating in Alaska during the summer of 2010, and Princess has no plans to redeploy a replacement ship there in 2011. Details will appear in today's edition of Cruise News Daily. As part of a new identity - Azamara Club Cruises - the line is becoming much more inclusive. With that in mind beginning Monday (December 14) the pricing will begin to reflect that with a price increase to take effect that day. Passengers booked before Monday will sail with the new program at the previously confirmed rates. Details of the new program will be in today's edition of Cruise News Daily. The US Coast Guard medevaced a 14-year-old boy from Royal Caribbean's Monarch of the Seas yesterday afternoon (December 3) while it was off the Florida coast. The boy was suffering from "appendix-like symptoms" and was airlifted to a Miami hospital for treatment. In this short Coast Guard video, shot from a second helicopter, you can see the Coast Guard MH-65C Dolphin helicopter hovering above Monarch's upper deck just aft of the skylight into the ship's atrium. As the video concludes you can see the stretcher being raised under the aircraft. Monarch of the Seas was on a 4-night cruise to the Bahamas which left Miami on November 30. Carnival Corp has ordered an additional 130,000-gt Dream-class vessel from Fincantieri for their Carnival Cruise Lines brand. The 3,690-passenger vessel will be the third in the series and is scheduled to enter service in the spring of 2012. A passenger went overboard early this morning (November 22) from Silversea's Silver Shadow as the ship was approaching Ft. Lauderdale. The Coast Guard received the call from the ship approximately 3am when it was about 20 miles east of Miami. The ship had already put rescue boats into the water and was remaining on the scene to search for the 62-year-old man. Approximately 7:45am he was located swimming about 20 miles southeast of Governor's Cut (near Miami). A Coast Guard MH-65 Dolphin helicopter crew from Miami flew to the position and lowered a rescue swimmer, who helped the man into the ship's rescue boat. The 28,500-ton Silver Shadow is turning around today at Ft. Lauderdale at the completion of a 9-day cruise from Barbados and before starting a 10-day eastern Caribbean itinerary this evening. Below is the Coast Guard-supplied video of the scene. Royal Caribbean announced that Oasis of the Seas' grand arrival into Ft. Lauderdale is going to be delayed. The strong winds and high seas it is encountering while crossing the Atlantic have delayed its arrival by two days from Wednesday until Friday morning, November 13. Yes, that's the 13th, Friday the 13th. Could that be an omen? Seeing amazingly carved melons on cruise ships isn't unusual. But if you combine that with pumpkins and jack-o-lanterns and Halloween, and then then you make it into a competition between the master carvers on a ship to see who can carve the most elaborate Halloween pumpkin, you have something quite outstanding. That's what happened aboard Cunard's Queen Victoria, according to cruise director Alistair Greener's blog, We Are Cunard. The blog shows photos of the host of unusual creations displayed in the ship's atrium. Oasis of the Seas has passed a rather important milestone on its deadhead delivery cruise from the shipyard in Finland to its public debut in Ft. Lauderdale next week. Yesterday it passed under the Great Belt bridge in Denmark (actually 7pm Saturday night Eastern US time). It had only two feet to spare, even after lowering its smokestacks into the funnel. A check of the map will show why transit under this bridge is so important. Some of the better coverage we've seen, with the better pictures was in London's Daily Mail and in the Associated Press (be sure to click the link at the side of the article for pictures). Hail! Hail! The Crew's All Here! In his blog, Royal Caribbean chairman Richard Fain reports that the last of the crew members have arrived in Finland today for duty on Oasis of the Seas which will be handed over to RCCL next week. The crew now totals 2,165. Earlier in an interview with Lisa Bauer, RCI's SVP of Hotel Operations, told Cruise News Daily subscribers that 95% of the crew is experienced on other Royal Caribbean ships. She said that the other 5% are filling jobs which are unique to Oasis and just don't exist on any other ship in the fleet, such as horticulturalists, bagpipers or high divers. High tech resumes and searches for work have even spread to the Gulf of Aden. Lloyd's List reports they have come across a profile on Linked In for Abdulla Ahmed. Abdulla is available for hire. His field is listed as "pirate in the Gulf of Aden," and he says his experience includes "Pirate, Shipping & Maritime Industry, January 2007 — Present (2 years 10 months)." He's interested in job inquiries, business deals and expertise requests. The Lloyd's List article list the link to his profile, should you be in the market for a pirate in the Gulf of Aden. Lloyd's List reports Carnival Corp is talking to Meyer Werft about a new two-ship order for their Princess brand. Meyer Werft isn't really commenting. Carnival does have a history with Meyer with their latest class of ships for their German AIDA brand being placed with the German yard. In recent years, all the orders for their other brands seem to have been going to Fincantieri. Costa Rica's Tico Times reports that a strike by dockworkers at Port Limon on the country's Caribbean coast caused Holland America's Zuiderdam to have to bypass the port yesterday. Port Limon is a popular port on cruises to the western Caribbean, and several other cruise lines have upcoming calls scheduled there. There is no indication how long the work stoppage will continue. When Oasis of the Seas sails out of the STX yard in Finland next week, it won't be quite complete. The thousands of plants aboard, especially those which will decorate the Central Park neighborhood, won't be installed until the ship reaches Florida. The Miami Herald reports that the order for some 12,000 plants has been keeping a couple of South Florida nurseries busy growing the plants for Oasis, which will be the world's largest cruise ship. The Herald says that it comes at time when business has been down for landscapers and nurseries in the area due to economic downturn and the slow housing market. The Bermuda Sun reports that the island of Bermuda expects 12,000 visitors arrive over the next six days on six cruise ships. The parade of ships begins today with Norwegian Dawn, followed by Silver Cloud, Jewel of the Seas, Caribbean Princess, Explorer of the Seas, and it ends with Norwegian Majesty. The article notes that the "herd" is completed by the Bermuda Islander arriving tomorrow with two cows and a horse. They should fit right in. It's hard to believe - with the first of the cruise schedules already announced for next year showing reduced deployment in the state - there are still editorials being written in Alaska saying how Alaska's tax package on the cruise industry (and its passengers) isn't really deterring people from going to Alaska. Two of the arguments being used are that the ships are still filled, and that when asked, cruise passengers interviewed say the $50 tax didn't stop them from coming and they weren't even aware of it. This is just nuts. Either the writers of these articles don't understand much about how the cruise industry operates or they don't want to. The cruise industry's business model is built on the ships operating at or near capacity and doing whatever is necessary to get them booked to that level. The way they accomplish this is to keep reducing prices until they have enough people booking in the market to keep the ships filled. So of course you can look at the ships last summer and say they are filled, but they are also being sold at significantly reduced prices. The cruise industry argues part of that reduction compensates for the $50 in taxes recently added by Alaska. The proponents of the tax say it is being paid by the passenger, so what's the problem? The problem for the cruise industry is that if the pricing weren't depressed, they could be charging $50 more, so in a way, the $50 is coming off the cruise lines' bottom lines. It seems that whenever one of these articles is written for consumption in Alaska, they interview cruise passengers in Alaska and ask them if the $50 tax bothered them. Of course it didn't. They are the people who came to Alaska. Who they ought to be interviewing are the people who didn't come to Alaska. Interview the people on the dock in Mazatlan and ask them if the $50 Alaskan tax influenced their decision to go to Alaska. Chances are you still may not find many people who say they didn't go to Alaska because of a $50 tax on Alaskan cruises, but ask them if they compared cruises to several destinations, and you may start to get a clearer picture. You'll better understand people choosing other vacations if you ask any travel agent how people compare prices between options on their vacation. They will tell you people compare the total prices, including taxes and fees, because those can be significant. If there's a factor that influences the consumer to choose between the cruise to Mexico or the Caribbean or Alaska, that's where you'll find it - in the total price. Still, you'll often find no big difference in the total price between cruises to Alaska and other North American destinations. That supports what the cruise industry says about it coming off their bottom line, because the $50 tax is there in the total price of cruises to Alaska. But the selling price isn't really what concerns the cruise industry; it's their bottom line. That bottom line - how much profit is made selling that cabin - the difference between the amount the consumer pays and all their expenses for operating the ship - is probably the most important factor influencing cruising's future in Alaska. If cruise lines can make more money selling a cruise in the Caribbean, for example, than they can in Alaska, that's where they will put the ships. By reducing the number of ships in Alaska in 2010, that's what they are doing. Indications from the cruise industry say there will be even further reductions in 2011 as other markets develop which can support increased capacity. The $50 head tax on passengers is only part of the taxation problem in Alaska. With other taxes and fees enacted at the same time as the $50 head tax, it's all just making Alaska a more expensive place for the cruise lines to do business, something Alaska can't afford to do. To tell Alaskans everything is ok and everything they hear is just big business rhetoric, is just nuts, because there's no denying there are many fewer berths (about 140,000) coming to Alaska next year than this year. When even the unemployed go on cruises, it's a sign that not only are the prices down, but the value is just irresistible. WFTV reports that George and Cindy Anthony were spotted returning from a cruise aboard Monarch of the Seas this morning at Port Canaveral. Their daughter, Casey, is in jail facing first degree murder charges of their toddler granddaughter, Caylee, in a highly-publicized case in Orlando which has drawn nationwide attention. In the raw video report the Anthonys didn't want to speak to the news media, but Mrs. Anthony can be heard saying they took the cruise to get away from the news media, but their presence at the pier had ruined the cruise for them. The Anthonys sailed on 3-night cruise Royal Caribbean's Monarch of the Seas, where rates as low as $179 per person are currently being offered. As we mentioned, the current cruise rates are irresistible and apparently caused Anthonys to join the Nation of Why Not, even though they have been unemployed for a year. The six Americans off Carnival Victory who got in a dispute with a taxi driver over a fare and were subsequently arrested by police on Antigua for fighting with them, have returned to New York after their month-long trial on the island. They ended up pleading guilty to lesser charges and paying a fine. The New York Daily News reported on their return last week. There are two interesting things about the article posted online. One is that they don't seem to have learned anything by the experience. The incident began when they they believed the taxi driver was trying to overcharge them. There were eleven people in the taxi, and the amount that was in dispute was $50. The difference would have amounted to less than $5 per person. They were in a different country with different customs and different standards and different laws. They were detained for a month during which time it has been reported that some of them were in danger of losing their jobs, and one had to take a semester off of school. They (or someone) had to pay their air fare back and other expenses they incurred during their time on the island, and they lost the last part of their cruise. Not once did any of them say it would have been a better idea to just go ahead and pay the taxi fare. The other interesting thing is how the tide of public opinion seems to have turned against them. The first couple of items posted in the Daily News seemed to have a lot of postings in the comments that supported them. This time there are few supporters posting, and they are far outnumbered by those who see the six as completely wrong. But what about the taxi driver at the center of the original dispute? He has plenty to say on the subject in the Antigua Sun. In any case, it's a safe bet that none of the six will be going back to Antigua any time soon. India's Tehelka magazine reports that the former US-flagged Independence (which used to operate in Hawaii) has arrived at Alang for breaking, but it's now at the center of a controversy due to the environmental hazards it presents. According to the magazine, there was apparently a deception involved to hide the true identity of the ship from officials and have it dismantled in violation of international environmental laws. At a live web event today, Norwegian Cruise Line named Trygve Vorren the captain who will bring out Norwegian Epic next year. Vorren is a Norwegian with 40-plus years of experience at sea, and he is currently captaining Norwegian Jade. Also announced as a captain will be Hakan Svedun, with 35-years at sea and 15 years in the cruise industry. Klaus Lugmaier will be the hotel director bringing the ship out. He has brought out the line's last eight vessels. Sean Wurmhoeringer will server as his alternate. NCL also announced the schedule for preview cruises for the trade. They will begin with a 2-night cruise from Rotterdam on June 19, followed by a 1-night transit to Southampton on June 21. The European cruises will end with a 2-night round trip from Southampton on June 22. The ship then makes its revenue crossing to New York. Once in the US, there will be a 3-night event in New York on July 2 and a 2-night round trip from Miami on July 8. (Due to US regulations, the ship will deadhead without passengers from New York to Miami.) The ship then enters regular revenue service on July 10. Lloyd's List is reporting that Oceania will not exercise the option they have with Fincantieri to construct a third vessel in the series they have on order with the Italian builder. The first of the two 65,000-ton vessels, Marina, is scheduled for delivery in September 2010, and the second, in July 2011. Sources are saying that Oceania is also in negotiation with Fincantieri to delay delivery of those two by several months. Neither Oceania nor Fincantieri have yet confirmed the information. Oceania and Fincantieri have now agreed to extend the option for the third vessel for one year. The extension is not surprising given Fincantieri's lack of new orders flowing in. Holland America's blog reports that the Azipod propulsion pods have been installed under Nieuw Amsterdam which is being built at Fincantieri's Marghera yard. The photos detail the massive size of the units. Nieuw Amsterdam is slated for delivery in July 2010. The US Coast Guard received a call from Holland America's Zuiderdam at approximately 6pm Tuesday (September 29, 2009) while the ship was approximately 23 statute miles southwest of Long Beach (California). The ship was reporting that an 85-year-old man aboard had suffered a stroke and needed to be evacuated to a shoreside medical facility. The Coast Guard dispatched an MH-65C helicopter from the Coast Guard Station at Los Angeles and arrived on-scene the scene 7:31 p.m. The patient was hoisted to the helicopter routinely and taken to a hospital in Torrance, California. Zuiderdam had just departed from Los Angeles en route to Cabo San Lucas as part of its repositioning itinerary to Ft. Lauderdale where it will ultimately scheduled to arrive on October 14. The crew of Holland America's Zuiderdam contacted the US Coast Guard at 10:55am Sunday when the ship was 5 miles west of Tillamook Bay, Oregon. The female passenger was found unconscious in a hot tub. The Coast Guard launched a 47-foot lifeboat from the Coast Guard station at Tillamook Bay to rendezvous with the ship and transport the woman to a local hospital. Zuiderdam is on a 3-night repositioning cruise which sailed on Saturday (September 26) from Vancouver to Los Angeles. Yesterday's installment of Cunard's blog (which is really hitting its stride) is particularly interesting. Blogger Alastair Greener visits the Fincantieri yard at Monfalcone (Italy) for an update on the construction of Cunard's next vessel, Queen Elizabeth. This installment shows the reader how the prefabricated blocks fit together to form the cruise ship. A 67-year-old woman has been reported missing from Sapphire Princess. She was last confirmed onboard Monday afternoon when the ship departed Ketchikan, but did not disembark when the ship arrived at its next port of Vancouver early Wednesday morning at the end of the cruise. Princess employees found the California woman's belongings still in her cabin Wednesday morning but did not find her aboard. At that point they notified the appropriate authorities, and the US Coast Guard and Canadian authorities began a search of the entire area between Ketchikan and Vancouver. According to the Coast Guard, Princess reviewed their surveillance footage from the cruise, and it contains an image of the woman going overboard about 6am on Tuesday morning, which would have put the ship in open water 57 miles east of Graham Island, in Canadian territory. Based on the location, the USCG suspended their search this afternoon. Based on survivability, the Victoria Joint Rescue Coordination Center told CND they to have now suspended their search. The ship was on a 4-night round trip cruise which departed September 19 from Vancouver and called only at Ketchikan. Details appear in the September 24 edition of Cruise News Daily. The US Coast Guard performed an interesting medevac from Carnival Spirit on Monday evening as the ship sailed between Vancouver and Hawaii. The Coast Guard received a call from the cruise ship Saturday afternoon advising them they had a critically ill 63-year-old man aboard while the ship was still hundreds of miles away from Hawaii. Arrival in Hawaii wasn't scheduled until Tuesday, and it was much too far for Coast Guard helicopters to meet. Saturday evening, the crew reported the man's condition was deteriorating. On Sunday afternoon, the ship again contacted Coast Guard advising them the ship's medical center was running low on a vital medication that the man needed, and they would run out by Monday afternoon at 2pm. The problem was that Carnival Spirit wouldn't be within range of the Coast Guard's helicopters until late Monday afternoon. The solution the Coast Guard devised was to make a drop of the medication by one of the Coast Guard's long range C-130's Monday afternoon at 12:30pm when Carnival Spirit was still 200 miles northeast of Oahu. The man was later medevaced from the cruise ship about 5:40pm when it was about 100 miles off the Oahu coast. The crew of a Coast Guard HH-65 rescue helicopter then delivered the man to a shoreside medical facility about 6:20pm. The Coast Guard provided video of the unusual medical drop. In the short video, you can see the crew of the C-130 in silhouette against the open back of the aircraft as it was making the precision drop. As the C-130 is pulling away, you can see how incredibly close it was to Carnival Spirit, shown to the right. This, of course, proves the Coast Guard delivers as well as making pick ups. There's a new suit in Alaska today, and it's not a parka. The nine cruise lines forming the Alaska Cruise Association filed suit in US District Court in Alaska seeking relief from the $46 head tax that the state imposed as part of the Citizens' Initiative in 2006. While there's much more to the issue that's causing the ships to leave Alaska, this suit deals only with the one. In the last couple of days that led up to the actual filing, the Alaskan media has run several stories, and the quotes they choose to use tell a lot about how things have gotten this far. The ACA suit has several points on which it says the $46 head tax is not legal. (Even though it is commonly referred to as a $50 head tax, by the way, the ACA is not disputing $4 of it which pays for the Ocean Ranger program to monitor cruise ship discharges.) First the suit says that the fee is essentially a fee for entering Alaska, something that is not allowed under federal law because it discriminates against interstate trade. The suit says the fee also raises much more money than it costs the state to provide services to cruise ships, and in setting it, it doesn't take into consideration any specific services to cruise ships. Another point of illegality, according to the suit, is that it is distributed to cities that aren't even on the ship's itinerary. And finally, it is being used to fund projects that have no direct benefit to the passengers who paid the fee. The bottom line, in the cruise lines' view, is that it is illegal according to federal law to charge admission to the state, and any taxes charged are to go directly to costs incurred by the state to handle the cruise ships or to fund specific projects directly related to the cruise passengers, and they should not be excessive of those costs. They also cite several precedents, and to the amateur, it would seem that the cruise lines have a good case. The state's lawyers, no doubt, have arguments to counter the cruise lines', but of course, they have yet to be heard from. The proponents of the Citizens' Initiative and legislative leaders interviewed by the local media in Alaska have used phrases like "We welcome the suit" and "We've been waiting for this," and questioning why the cruise lines don't work with the legislature to resolve their issues. That last point was answered by Carnival chairman Micky Arison several months ago, when during an earnings call, he said they have been unable to find any legislator who wants to sit down with them to seriously discuss the issues. It seems that Alaska's elected leaders and most of the citizens are simply dug in and don't want to work with the cruise lines. As CND has reported before, the head tax is only a small part of the full issue. With the enactment of the Citizens' Initiative in 2006, along with the $50 in taxes paid by the cruise passengers came a bunch of taxes imposed on the cruise lines themselves and some very stringent regulations which are very expensive for the cruise lines to comply with. The issue in total is that the State of Alaska has made it become vastly more expensive for the cruise lines to operate in Alaska at the same time as the economy has made consumers unwilling to pay higher prices for cruises (to offset the lines' increased costs). The cruise lines are now in the process of setting the 2011 deployments for their fleets. As more profitable markets are identified and developed, more ships will be redeployed elsewhere. Every year, Alaska does nothing to decrease the cruise lines' costs, it's likely more ships will be withdrawn from Alaska. The sad part is that Alaska's tourism industry, which is such a major part of the state's economy, is about to crumble. The state's leaders and most citizens don't understand they have a product to sell, and the cruise lines are their customers. If they don't do something to make their product more competitively priced with their competition (other destinations), they won't have any customers left. Ambassadors International has sold the laid up Queen of the West to Blue Spruce, an affiliate of American Cruise Lines. Ambassadors has had all their non-Windstar assets for sale, as they focus the business on the Windstar brand. They have also recently completed some restructuring of their debt to better their current cash position. Queen of the West has 71 staterooms and most recently sailed on 7-night cruises on the Columbia and Snake rivers from Portland, Oregon. The sale price was not disclosed. When Disney Cruise Line announced their Alaskan program last week, along with it came a photo of Mickey Mouse standing on the pontoon of an iconic float plane. That photo didn't just happen to get taken a few minutes before the announcement. In the Juneau Empire's article about the new program, they've included a unique slant to the story: how that picture came to be taken several weeks ago, apparently in preparation for the announcement. The Disney people had very specific requirements as to what they were looking for. For the complete story, check the Empire article for a little behind-the-scenes about the planning for the announcement. Azamara has hired Bert Van Middendorp to fill the position of Associate Vice President of Hotel Operations. Van Middendorp most recently served as SVP of Hotel Operations and Quality Assurance for Seadream Yacht Club. He has extensive experience in the hotel operations and customer service areas having previously held positions at Cunard, Seabourn, Royal Viking, and the Crest Hotel Group in Amsterdam. The Antigua Sun reports that testimony continued Monday in the case of six Americans off Carnival Valor in Antigua who refused to pay their taxi fare and then fought with police. Monday's testimony was from uninvolved bystanders. The more we hear, the more bizarre the incident seems, and the worse things seem for the Americans, especially considering this was all over $50 in taxi fare. According to the story, the fighting continued even after they were in jail. To be amazed, read the Sun article, but be sure to have a pencil handy so you can keep track of the players. According to the Cayman Net News, it seems Grand Cayman is finally ready to take another step toward having a place for cruise ships to actually dock. As we've reported in Cruise News Daily, the plan has been mired in dispute and red tape. In our most recent CND article, the Caymans now are seeing the cruise industry's premier ships actually bypassing the island, and apparently that has lit a fire under the government to get the project moving. Update 3pm. The fire may be there, but it's not a roaring fire. According to Cayman Net News, the deadline for bids has now been extended for another week. Testimony resumed on Friday in Aruba in the case of six American tourists off Carnival Victory who got into a dispute one week ago with a taxi driver over the fare he was trying to charge them. When taken to a police station, a brawl with the police ensued, resulting in the Americans' arrests. From Friday's testimony it now is clear this was no little pushing and shoving match. The AP report says, "Prosecutors presented as evidence dozens of pictures showing the officers' injuries, including one of a bite wound that required stitches." According to the more detailed account in the Antigua Sun, the abuse of the police officers was also extremely verbal, according to the officers' testimony. It also reveals that some of the Americans just wanted to pay the extra taxi fare and be done with it, and it was only some of the Americans who were so belligerent. The trial will continue on Monday. The Antigua Sun is reporting that local trade associations are moving to distance themselves from the incident which happened there last week where six American tourists off Carnival Victory were involved in a brawl over a taxi fare and arrested for fighting with police officers. The incident, by the way, is still not resolved for the cruise passengers. The court proceedings are in recess until Friday. The Miami Herald reports that US Customs & Border Protection has instituted a zero-tolerance for cruise passengers in connection with marijuana possession. Over the Labor Day weekend the new policy resulted in six arrests in Miami and five at Ft. Lauderdale. The Vancouver Sun is reporting that Disney Cruise Lines will announce today that they will be sailing a program of cruises from Vancouver to Alaska with Disney Magic. The court proceedings began yesterday (Sept 9) in Antigua for the six Americans accused of fighting with police officers. In our earlier entry, we reported the fight ensued when the six, who were ashore from Carnival Victory last Friday, refused to pay an additional $50 taxi fare the driver said was due, and he took them to a police station. The Antigua Sun carries an account of Wednesday's proceedings. What we know from all accounts in yesterday's testimony seems to be that there was a fight and the "enthusiasm" with which the participants fought. The court is now in recess until Friday. A BBC article shows just how easy it is for norovirus to spread through a cruise ship. According to the article, one passenger boarded Fred Olsen's Balmoral on Saturday, and she was detected at that point to have norovirus. She was confined to her cabin by the medical staff. The woman did not stay in her cabin as she was requested to do, and now, by Tuesday, 91 passengers have the virus. Kind of makes you sick, doesn't it? A new port proposed for Venice could hasten the sinking of the island city according to an article in the London Telegraph, which attributes the information to the Royal Institute of British Architects. The culprit, according to article, is the additional dredging that will be needed to accommodate the large ships. The article calls Venice one of the world's busiest cruise ports, citing the rise in cruise traffic from 200 cruise ship calls in 2000 to 510 in 2005. A collection of memorabilia from the SS United States that has filled a Nags Head (NC) restaurant has been donated to the Mariners' Museum in Newport News (VA). The museum already has a propeller and other artifacts from the classic liner, according to WVEC in Newport News, but this will significantly expand the collection. Video accompanies the text story on the WVEC website. Six Carnival Victory passengers were left behind at Antigua last Friday when they were arrested due to a dispute with a taxi driver, according to the Associated Press. The three couples had paid $50 for a tour by taxi which ended at a local beach. When they found out they had to pay another $50 taxi fare to get back to the ship, they allegedly became unruly, and instead of taking them to the pier, the driver took them to the police station, where, according to the police, they scuffled with police officers. The six were charged with malicious damage, assault and wounding the police officers. They were released on Monday after paying a bail of $5,000, pending their arraignment on Wednesday. Let's see. Attorney's fees. Hotel on Antigua for six for three nights, several hundred dollars. Extra air fare home for six, several thousand dollars. Bail for six, $30,000. Three nights in an Antigua jail, priceless. It would have been cheaper to pay the extra $50 taxi fare. Update: We can always count on a more colorful report from the New York Post. The Antigua Sun adds some more details and commentary. Update: The court proceedings began on Wednesday. Updated story on Cruiseblogger. This video gives viewers a quick tour of the Meyer shipyard at Papenburg, Germany (map) on the occasion of the keel laying for Disney Magic last week. There's an interesting entry on Princess Cruises' Facebook page. When the crew of Caribbean Princess suddenly found themselves with an unplanned night in New York last month, see what some of them did in this short video. It's been widely reported that a passenger went overboard from Carnival Sensation late Wednesday evening (September 2, 2009). A search was immediately begun by Carnival Sensation and other ships in the area. The man was heard yelling for help and was recovered very quickly (within 90 minutes) by the crew of Disney Wonder, even before any Coast Guard assets could get on the scene. WPBF tv in West Palm Beach has exclusive video of the rescue and the man being brought aboard the Disney ship, shot by a passenger. The entire video runs more than 15 minutes. If you want to skip ahead to the real action, it starts about 7 minutes into the run, but even the earlier scenes are interesting as you can hear the announcements to passengers on the open decks to remain quiet so they can hear the man in the water and the cheer that goes up when the man is rescued. It's not often we have such a happy ending to report. Cunard Line has chosen Captain Chris Wells to be the first master of Queen Elizabeth, which will be delivered in the fall of 2010. 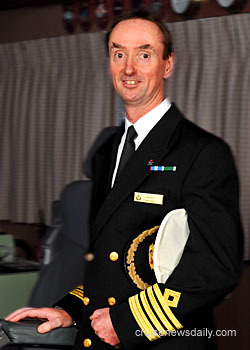 Wells previously served aboard QE2 where he rose to the position of staff captain. From there he was chosen to be the first staff captain of Queen Mary 2 and worked on that ship's newbuild team, bringing it out of the yard. 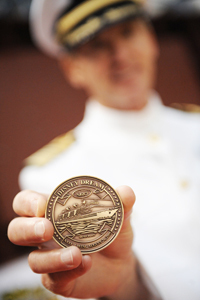 Last year, he was appointed to be master of QM2, the position which he currently holds. Captain Wells will shortly be reassigned to Monfalcone (Italy) where he will be involved in the building of the new ship at the Fincantieri yard. The eye of Hurricane Jimena has passed to the west of the popular port city of Cabo San Lucas, but the city still experienced strong winds, rain and heavy surf. The tourist board at Los Cabos says that Cabo San Lucas escaped major damage, and the area is again open for business. (The airport has already reopened.) There was no known damage to the hotels and tourist attractions. Storm debris (palm branches and such) does litter the streets, but it should be cleaned up very quickly. At this point, cruise lines haven't officially announced their returns, but it's expected that they will return with their next regularly scheduled calls. There's evidence that at least some people in Alaska have figured out that their tourism industry is in trouble now and is headed for more trouble. The Anchorage Daily News ran an article at the end of last week by Tom Bradner, an economist in Alaska, and he has figured out why there's trouble in the 49th State. He came to many of the same conclusions we did in a recent Cruise News Daily article. The recent tourism summit proves that at least some of the leaders are getting it, but they still aren't fully understanding what's causing the problem, so their solutions have little chance of working. But just when you think there may be a light bulb going on in Alaska, you read the comments from ADN readers at the bottom of Bradner's article, and you see the average citizen in Alaska just doesn't get it. To accommodate the larger number of passengers on Disney Dream and Disney Fantasy, Disney is expanding the facilities on their private island in the Bahamas, Castaway Cay. Along with the larger facilities will come some new ones as shown in the video below. Completion of the work is planned for the summer of 2010. Frankly what attracted us to this Philadelphia Inquirer article is the stunning photo of SS United States, stored in Philadelphia, as seen from all places, the IKEA store. The classic liner was acquired for NCL America when the line planned to expand their American-flagged operation. Market conditions never allowed the line to expand, and the cost of rehabilitating the ship has continued to escalate. With the change of ownership structure of NCL America, ownership of the vessel recently reverted to Star. They see no use use for the ship in the foreseeable future, and even simply storing it is a tremendous cash drain, so they put it on the market some time ago. The subject of SS United States' future has come up in many of CND's interviews with NCL and Star management over the years since it was acquired in 2002. The principals seem to have a real understanding of both the business and historic value of the vessel, some of them taking a real personal interest. Although most outsiders don't believe it, we believe scrapping the ship, just to get rid of it, would be a last resort for Star. As the Inquirer article indicates, there are people trying to raise money to purchase the ship, but that's only a tiny portion of the problem. If it were just a matter of buying the ship, there are a number of sources that could probably raise the cash quickly. The major battle would then be what to do with the ship. The cost of maintaining it is phenomenal. Check out the Philadelphia Inquirer article and the article that appeared on Jaunted. The BBC reports that a couple visible changes were made to ready QE2 for it's trip to South Africa where it will be used temporarily for a hotel. To comply with maritime law, the homeport of Southampton had to be removed from the ship's stern, and the "Cunard" brand had to be removed from the sides to comply with the terms of sale from Cunard. The changes were required since it is being taken out to sea. They had been left there (and presumably restored once the ship returns home to Dubai) to preserve the authenticity of the ship as a museum. The new owner, Nakheel, still plans to eventually convert QE2 into a hotel and entertainment center permanently moored at Dubai. The deployment to Cape Town is planned to last 18 months. The Daily Echo reports the port of Southampton is going to have what they consider to be a busy weekend. They will have nine large cruise ships in port over this weekend. The port expects huge crowds coming out to see the ships. Not only that but they are actually free running bus tours. Saturday will see Royal Caribbean’s Independence of the Seas, P&O Cruises’ Oceana, Fred Olsen Cruise Lines’ Black Watch and Cunard’s Queen Mary 2 in port. Sunday the ships in port will be P&O Cruises' Oriana, P&O's Ventura and P&O's Aurora along with Cunard’s Queen Victoria. As we said, everything is relative. Ft. Lauderdale would consider those really light days. A small boat from the Key West Coast Guard station evacuated a 76-year-old man from Carnival Liberty Friday morning about 7:00am when it was about 20 miles south of Key West. 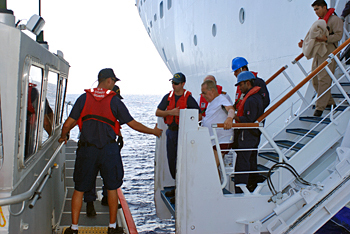 The US Coast Guard received a call from Carnival Liberty Thursday night (Aug 27, 2009) about 11:00pm while it was en route from Cozumel to Miami saying a passenger was suffering from cardiac arrest and needed to be transferred to a shoreside medical facility. The ship was about 260 miles southwest of Key West at the time. A rendezvous was set up for Friday morning as the ship passed near Key West. The man and his wife were picked up in the Coast Guard vessel and transferred to a medical facility in Key West, as shown in the photos below. On Monday Cruise News Daily told readers how Norwegian Cruise Line had opened a waitlist for Norwegian Epic's first revenue cruise, which will be a transatlantic crossing. The 150,000-ton ship is a new concept vessel currently under construction at the STX Europe yard in St. Nazaire, France. The delivery date is not yet finalized so NCL has not yet set the crossing's itinerary, dates, the length or even where it will begin or end. All that they can confirm is that it will be in the early summer sometime before the July 17 (2010) inaugural cruise from Miami, and the lead rate will be $699. Passengers can be put on a waitlist for the crossing, and will be contacted when the details are set this fall. Since the waitlist was opened this week, the line reports strong demand for space on the list, signaling unprecedented interest in the new ship, according to the line. “We’ve seen great demand for the waitlist so far, as these guests will have the first priority to book this cruise before we open it to the general public,” said Andy Stuart, executive vice president of global sales and passenger services for NCL. Information about Norwegian Epic is on the ship's website. Customers interested in the transatlantic crossing can call either their travel agent or NCL at 866-234-7350. Houston's new Bayport cruise terminal, which was completed a couple years ago, still sits empty waiting for a cruise line to homeport a ship there. Click2Houston (KPRC NBC) has a report on the $81 million facility that was built before they had a cruise line committed to cruise from there. They take a rather critical view of building the facility, but in today's environment, cruise lines aren't about to commit to serving a port when no terminal is actually in the pipeline, even a temporary facility. Houston took the approach that rather than build a temporary terminal and then quickly replace it with a permanent one, they just went right for the permanent one. As the report fails to point out, it takes time to market to cruise lines, and then once sold, it takes a couple of years before the first ship comes. There's plenty of competition for ships, and having a turnkey operation such as Houston now has, gives Houston a decided advantage in the game. In addition to the text article, there's also a video report. A passenger from Norwegian Sky died at Great Stirrup Cay on Thursday (August 27) in an apparent accident. It took until this morning, however, to locate his body. Great Stirrup Cay is Norwegian Cruise Line's private island in the Berry Island chain of the Bahamas. Norwegian Sky has stopped at Great Stirrup Cay as the last call on a 4-night cruise which left Miami on August 24. Details will be in the Friday edition of Cruise News Daily. This is another case of a cruise passenger who declined to purchase travel insurance and then needed it. The story comes from WPTV in West Palm Beach about a family sailing aboard Carnival Valor which stopped at Grand Cayman. Briefly, the woman had a medical procedure on her heart before going on the cruise which involved a small incision, and it began to bleed. Apparently her doctor told her just to put a bandage on it, and it was nothing to worry about. That's when the ship's doctor got involved and sent them to a hospital on Grand Cayman. He apparently didn't want to set out on an overnight leg of the trip to Roatan (where shoreside medical assistance may be less sophisticated) with the possibility of further complications arising with her heart. The hospital on Grand Cayman wouldn't release the woman in time for the ship to sail, and Carnival wouldn't let her back on the ship without a release from the hospital. The family had to fly home on their own. Granted, this is probably one for the lawyers to settle, but the out-of-pocket expense could have been avoided if she would have purchased a comprehensive travel insurance policy. Details are in the WPTV text story or video below. Meyer Werft laid the first block of Disney Dream's keel today at their Papenburg (map) yard. 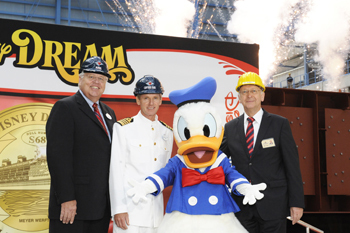 Disney dream is the first of a pair of 128,000-ton vessels on order for delivery in 2011 and 2012. 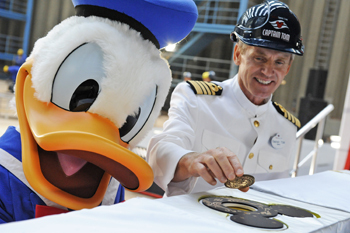 As you might expect from Disney, the ceremony was not your typical low-key keel-laying. Disney's Captain Tom Forberg shows the special Disney "good luck" coin that was set before the first block was lowered onto it. Captain Donald looked on and vowed he would never sail the ship to Peking. Dominica News Online reports that the island's number of cruise visitors has increased despite the global financial crisis, according to Dominica's tourism minister. Not only are they expecting an increase in the number of cruise ships calling, but they also expect the number of visitors disembarking to show a whopping 30% increase this winter from 500,000 to 650,000. Another interesting point to note in the article is that Dominica has one of the highest percentages of passengers disembarking of any port in the region. Royal Caribbean Chairman Richard Fain was at the STX Europe yard in Turku (map) last week and took some pictures of Oasis of the Seas as its interior moves toward completion. He published the photos on his blog. Ship pilots at Galveston have suddenly withdrawn a request for an increase in their rates. They had wanted an overall 5% increase in their net pay, but had earlier agreed to reduce the number of pilots they require on cruise ships from two to one. (They were only charging 50% for the second pilot, by the way.) To compensate for the loss of that income, they were proposing a 7.1% increase on their fees to guide cargo vessels, which would then average out to the 5% increase in the average pilot's paycheck. The cargo lines then balked at that, feeling they were being treated unfairly when they cruise lines' rates would effectively go down, and they threatened a lawsuit. Literally minutes before the Board of Commissioners was to vote on the increase, they pilots withdrew their request, saying they didn't want to bear the expense of defending their position in a court battle. According to the Houston Business Journal, the average pilot made $314,453 in 2008 for 26 weeks' work. Additional coverage is available in the Houston Chronicle. A 62-year-old woman passenger was medevaced from Carnival Paradise Sunday (August 23). This Coast Guard video gives a little different perspective than we normally get (from what's happening inside the helicopter). The operation occurred above Carnival Paradise around 5:15pm Sunday afternoon about 25 miles west of Point Loma (California). The ship had earlier notified the USCG that the woman was suffering from a head injury and needed to be transported to a shoreside medical facility. The Coast Guard dispatched a MH-60J Jayhawk helicopter to meet the cruise ship. After arrival at the hospital, the woman was listed as in stable condition. This week, Alaskans held another "tourism summit," and it shows they are now recognizing their tourism industry is heading into deep trouble, but from the media reports coming from the summit, they still haven't figured out why, but they are jumping ahead to the step of trying to figure out what to do about the declining numbers, especially of cruise ship passengers. That brings us to the next big thing that Alaskans are missing. Alaskans have a product/service they want to sell (Alaska), and the cruise lines are the potential customers. They can't set the price (the taxes and fees the cruise lines pay) so high for their product that they aren't competitive with their competition (ports in other areas of the world). Just as a restaurant would market to consumers and offer incentives (to keep regular customers), Alaska needs to be doing things to make their destination as attractive or more attractive to do business with than the port "down the street." Rather than putting several million dollars into a consumer marketing campaign, as is being proposed, Alaska would probably get much more bang for their bucks if they put that money into incentives for the cruise lines (to keep ships there) to defray the higher fees and taxes imposed on them in Alaska. A subpoint the folks in Alaska don't understand because the cruise industry changed in the last decade (while Alaska's attention was on figuring out new fees they could charge and restrictions on operations) is that there is a worldwide competition for ships, not only among ports within an area, but also among regions of the world. There are many new emerging source markets, and they all want ships sailing close to their home. Alaska is no longer competing just for Americans to choose to take a cruise there instead of the Caribbean or Mexico. They now have to compete just to keep that ship in the American-sourced market rather than sending it off to the Mediterranean for Europeans, Central America for South Americans, Asia for the Chinese or the South Pacific for Australians. The next big thing Alaskans are still missing is it's not the downturn in the global economy that's causing their main problem. Certainly that plays a role in people spending less once they get there, and it is also causing the cruise pricing to be reduced to fill the ships, but each ship that comes is operating at or near capacity. Those rates the cruise lines can charge have fallen but at the same time, the costs to cruise lines of doing business in Alaska have also risen dramatically. Ticket prices have fallen all over the globe, and cruise lines are dealing with that. The issue really isn't the price or the cost alone; the big thing to the cruise lines is the profit margin, which in Alaska has shrunk to much less than in other parts of the world. There's not too much Alaskans can do to increase what consumers are willing to spend for a cruise, but there's a lot they can do to reduce the costs of the cruise lines in Alaska. The last big thing that Alaskans seem to be missing, at least according to the tone of the coverage of this week's summit, is that this is not temporary. When the economy improves, the ships that have left Alaska aren't on rubber bands, so they won't snap back. Removing them from the market has been a slow process as other markets have grown, and the cruise lines have taken time integrating them into other markets globally. When the economy improves, they aren't about to jerk them out of a then-successful market to increase Alaskan capacity, which would depress pricing. Instead, the cruise lines will be thrilled there is more demand for the existing capacity they have in Alaska so that will drive ticket prices up. So Alaska's focus needs to be on keeping the ships they have, rather than letting them sail away, because once they leave, it will be tough to get them back. Alaska has some smart people living and working there, so it's hard to understand why they aren't seeing the real situation and what needs to be done. Perhaps they've been in a seller's market so long, they just can't think in terms of having to compete. Now is the time they must change their thinking, however, or they are going to be faced with even further shrinkage of the fleet of ships in 2011. If you'd like to read more about the tourism summit to better understand the thinking in Alaska, there are three articles which should prove interesting. They point out some of the losses Alaskans realize they are facing, and some of the costs which, at the same time they impose. 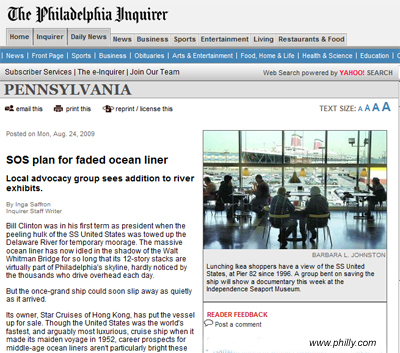 This article originally appeared in the August 21 (2009) edition of Cruise News Daily. A 45-year-old woman went overboard from Holland America's Zaandam while it was cruising in Alaska on Monday. The last contact the ship had with her was when she ordered room service about midnight. The woman's traveling companion reported her missing about 10am (local time) Monday morning, meaning she would have gone overboard between Douglas Island and Glacier Bay National Park. The Coast Guard search was concentrated on Stephens Passage, Lynn Canal and Icy Strait, and the National Park Service was searching the shoreline in Glacier Bay National Park. The Coast Guard utilized a helicopter, two patrol boats and two rescue boats. The Coast Guard estimated the water temperature to be approximately 57 degrees. About 4:30pm (local time) on Monday, a body believed to be the woman was discovered on the west side of Douglas Island. The local coroner is working to identify the remains. Zaandam is on a 7-day cruise to Alaska from Seattle which departed last Friday (July 31). Details will be in today's edition of Cruise News Daily. Celebrity Equinox arrived at Southampton on July 19 for almost two weeks of inaugural festivities. The ship will be christened there on Thursday, July 30. This video report show the arrival and details some of the new ship's features. The ship is the second of the class. It will be followed next year by Celebrity Eclipse which will be based in Southampton for the summer season. FBI agents boarded Carnival Elation when it returned to San Diego this morning. Carnival had contacted the FBI Tuesday evening to report that a woman was apparently killed by her husband during a domestic dispute in their cabin. The incident occurred after the ship left Cabo San Lucas on Tuesday when the ship was in international waters. The FBI and the US Coast Guard were advised on Tuesday. 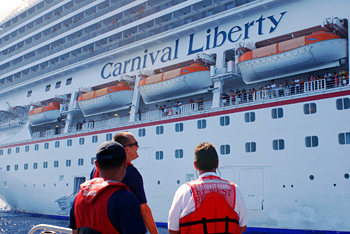 The man was taken into custody by Carnival personnel and held aboard the ship. Carnival Elation spent the day at sea on Wednesday, and arrived back in San Diego this morning. Carnival Elation had departed San Diego on Saturday, July 11 on a 5-day cruise to Baja California. The video below is an interview with the FBI agent involved with the investigation. German designer and entrepreneur Jette Joop will be the godmother of AIDAblu. She will christen the ship in Hamburg on February 9, 2010, just before it departs on its maiden cruise. AIDAblu is currently under construction at Meyer Werft and will be the fourth in the six-ship class. It will be the seventh vessel in the AIDA fleet. AIDA is a brand of Carnival Corp that markets in German-speaking countries. Details appeared in the July 1, 2009 edition of Cruise News Daily. Like many stars before him, noted musician James Taylor and his family sailed aboard Cunard's Queen Mary 2 last week on an eastbound transatlantic crossing from New York to Southampton. During the crossing he performed twice to SRO audiences in the ship's 1150-seat Royal Court Theatre. He also accommodated passengers by scheduling a Q&A session and posed for hundreds of pictures during an autograph session that was extended to two hours due to the demand. "It is such a civilized way to go, and Queen Mary 2 is the last word in first class travel," said Taylor. Now in England, Taylor begins a 10-week, 22 concert tour that will take him to nine countries. In the video below, Taylor talks about the experience crossing the Atlantic aboard QM2. Realizing that they were getting aced out of the cruise business as ships became bigger, Belfast spent £10m upgrading one of their deep-water berths to be 1,040 meters long, and the first ship to use it was Crown Princess this morning. It is estimated that the cruise industry brings about £15m annually to the local economy. The BBC article also includes video. Remember Greg Surratt? He was the man aboard Royal Princess during the fire updating his Twitter account, which unwittingly was keeping hundreds, if not thousands, of people informed of what conditions were like aboard the ship, 140 characters (or less) at a time. He's home now and has updated his blog, telling his story of his trip, the fire and his journey home. As you can tell from his account, the emergency procedures were handled just as they should have been, and he has praise for the way Princess took care of the passengers and compensated them. He mentions that several maritime personal injury attorneys began following his tweets. What he may not know is that they seemed to retweet his messages about the fire or things that weren't going well, but they didn't retweeted his postings that had anything positive to say about the way Princess handled it. So much for truth in tweeting. He also seems surprised that Princess could update their website with information before the passengers had it on the ship. That speaks to miracle of modern communication and the ability it gives the home office (in California) to be very, very involved in every aspect of the ship's operation - in daily life and emergency situations. We're glad Mr. Surratt and all the passengers are home safely. His blog is an interesting read. After patching the hull of Oceanic with epoxy, the owners of the ship a/k/a The Peace Boat, have decided to have it drydocked at Bayonne (NJ) on Sunday to permanently patch the small hole. The Coast Guard has approved the movement. The passengers will have to disembark and be put up at hotels in the New York area until the repairs are completed and the Coast Guard allows the ship to sail. “The fact that the owners of the Oceanic are sending it to dry dock shows their commitment to repairing the vessel and ensuring its safety,” said Cmdr. Anthony Ceraolo, Coast Guard Sector New York. The Coast Guard did not give an estimate when the ship would be allowed to sail. Coverage of the original detention was in an earlier item here on Cruiseblogger. The US Coast Guard advises they detained SS Oceanic, which is currently operating as the Peace Boat, at New York on Thursday night. The ship arrived at New York Thursday morning with 848 passengers aboard. The Coast Guard was performing a routine inspection when they discovered minor hull damage and several maintenance deficiencies. A small hole was discovered, leaking approximately one gallon of water per hour into the vessel. Coast Guard inspectors also identified 16 discrepancies in the lifesaving, fire fighting, safety, and other maintenance categories. These also included a crack in the hull below the waterline on the port side of the vessel. The inspection began at approximately 9:00am and concluded about 11:30pm when the ship was declared detained. According to the Coast Guard, Oceanic will have to remain in New York "until the master can provide a repair proposal and can make necessary repairs that directly impact the ships passengers and crew." Oceanic will be familiar to many readers as a popular classic ship sailing for several lines over the years. It was delivered new to Home Lines in 1965. In 1985 it was purchased by Premier Cruises and sailed at StarShip Oceanic and Big Red Boat I. From 2000 to 2009 it sailed for Pullmantur under its original name, Oceanic. In March the ship was sold to a group which markets lengthy world cruises under the name of the Peace Boat. Oceanic arrived New York Thursday morning from Iceland. It's next scheduled destination is Venezuela. Its schedule calls for a departure from New York at noon on Saturday, but it will not depart until it is given clearance by the Coast Guard. Saturday update on the situation. Pirates, look out! Republican Congressman Frank LoBiondo of New Jersey has introduced a bill in Congress that, if enacted, would give immunity to US merchant mariners who wound or kill a pirate in response to an attack. The US Mariner and Vessel Protection Act would give the US Coast Guard the responsibility of certifying seamen's training and developing the specifics as to under exactly what conditions immunity would be granted. The bill also would direct the US to negotiate agreements with other countries which would grant immunity in their waters and be sure the US mariners are allowed into their ports with firearms aboard the ships. The bill is cosponsored by Representatives Howard Coble of North Carolina, Don Young of Alaska and John Mica of Florida. Of course, the bill has a long way to go from introduction to passage and becoming law. Meyer Werft took Celebrity Equinox down the Ems river Saturday from Papenburg (Germany) to the Dutch town of Eemshaven from which it will depart on its sea trials. In addition to the testing done at sea, there's still work to be done on the ship's interior prior to its delivery next month. As you'll see from the video below, the river transit is a slow methodical process (with the ship going backwards). Many times during the transit, there are just inches to spare on either side and under the ship. We also have some photos of Celebrity Equinox on the river courtesy of a reader Rolf Declerck. Things are falling into place (seemingly) smoothly for passengers having to disembark Royal Princess unexpectedly at Port Said. The passengers spent Friday night aboard the ship with all hotel functions once again operating normally. All passengers will have to disembark on Saturday. Princess reported that a group of 20 Princess Care Team members arrived in Egypt Friday evening (local time) to assist passengers with travel arrangements home. While they were traveling there, the air department in California had been securing air arrangements for everyone. By 8pm (EDT) Princess reported they had air arrangements confirmed for all passengers. They have also secured 300 hotel rooms in Cairo for the passengers who won't be flying out until Sunday, and they've reserved 24 motorcoaches to transfer passengers from Port Said to Cairo. Passengers will begin to disembark from Royal Princess Saturday morning at 10:30am local time (3:30am EDT), and Princess has also arranged for 24 porters to be on the pier to assist. For information about the cancellation of the Royal Princess cruises, please see our earlier blog item. Another one of those people behind the scenes whom long-time readers know - but don't know their name - has moved on. When you read about an incident on one of the ships of a Royal Caribbean brand, and the article said, "a Royal Caribbean spokesperson said," chances are that spokesperson was Michael Sheehan, the Associate VP of Corporate Communications. Be it a hurricane scattering ships, a passenger overboard, a fire in the engine room, or a ship bumping a pier, for just short of a decade, Sheehan was almost always the go-to person at RCCL with all the details. Friday was Michael's last day at Royal Caribbean in Miami, and he's moving on to Seattle due to a family situation, and we wish him well. You never know; he just might resurface in the cruise industry again. The Yachts of Seabourn reports they took delivery of the 32,000-ton Seabourn Odyssey on Thursday, the first newbuild in the luxury sector in six years. The handover was at the T Mariotti yard in Geona. The ship immediately left for Venice where its official naming will take place on June 24, just prior to its maiden voyage. Details appeared in the June 19 edition of Cruise News Daily.